In Miyazaki town, there are two temples famous for this carving. On January 8, the Day of Yakushi Nyorai, these toys were sold by the shops near the temple. Even now there are still two or three craftsmen who make them for this day. The wheels are inserted with a bamboo stick, the holes are burned in the sides of the aralia wood with heated metal chopsticks for the hearth. at the shrine Kishibo Jinja 鬼子母神社, deity for childbirth and childcare. To apply the wheels, a cut is made in the lower part of the body. This way the toy has a more female, gentle look. Nowadays, there is nobody anymore to make these toys in the village near the temple. Nearby, 兵頭正一 makes these dolls to our day, but he has difficulties finding a disciple to carry on the craft. The patterns on the back were created according to old records.They are said to be old Korean patterns. Hisamine Uzura Guruma or Hisamine Quail Toy Car is a traditional folk toy whose history has been passed down for years in Miyazaki City, Miyazaki Prefecture. Since Edo era, quail has been a familiar bird in Miyazaki region and local people adore them. It was a local practice to keep the birds to enjoy their calling. Quail in Japan breed in Hokkaido and northeastern Japan from Spring to Summer, then migrate to warmer areas of Shikoku and Kyushu from Fall to Winter. Uzura Guruma is a children’s toy based on the quail. Japanese Angelica tree is used for the body and bamboo is used to make the axle of the wheels. On its side is a word, “の”, to pray for children’s safety and happiness. 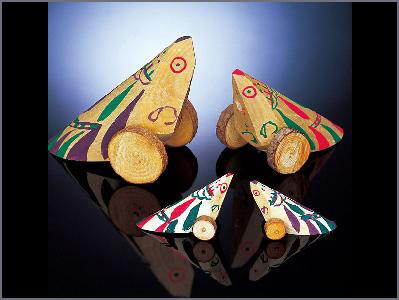 In old days, the quail toy car was sold at religious festivals in Hisamine Kannon and Kishibo Shrine. They are still loved by the locals and can be seen being displayed by the front entrance of each household. There are two kinds of quail toy cars in Miyazaki City; One in Hokkedake Yakushi-ji Temple and the other one in Hisamine Kannon. Hisamine quail toy car has a more feminine look. In the year 807 the priest Dengyo Daishi 伝教大師 (Dengyoo Daishi) founded these two temples. An old man, who had come over from Kudara (Korea), tried to carve a Buddha statue of Yakushi Nyorai on his 100th birthday. He had collected many branches of the aralia tree and cut them into these shapes. He also painted simple patterns for their eyes and on the back. He was one of the many Koreans who had moved to Japan to bring silk culture, brewing and weaving to Kyushu. This toy will keep children healthy and well. They are carved with a hatchet (nata) from branches of the aralia tree (Angelica tree), in a simple triangular form. Then two wheels are attached and red and black collors applied. This region of Miyazaki was famous for its quail hunting in the Edo period. Quail was also cherished because of its eggs. And people kept them just to enjoy their calling. Quail live in the Northern parts of Japan during spring and summer, but migrate to warmer parts in winter. The wheels of the toy try to imitate the sound of the birds. Children could enjoy rolling it downhill or grabbing the tail and shake it while producing the sound. The letter no の is believed to ward off evil influence (yakuyoke) and keep the owner healthy. The toy from the Kannon temple is also a talisman for long life (enmei chooju　延命長寿）. Gitchau / Gitchoo is a stick and a ball to be rolled with it. 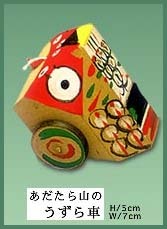 It is said to be the ancestor toy of the battledore (hagoita) and reminds people of the silk cocoons (mayudama). It was the "golf of the Heian period". Adatarayama is a volcano in the North of Fukushima prefecture, It is about 1700 meters high, and there are hot springs in the region.
. . . CLICK here for Photos of the mountain ! This toy from Fukushima looks similar to the one fro Miyazaki, but it is not as old. It has been made in the town of Nihonmatsu.
. Kato Shuson, 加藤楸邨 .
. Mount Adatara-yama and Fudo Myo-O 不動明王.
. Fukushima Folk Toys .
. Reference . うずら車 .
. Yakushi Nyorai 薬師如来 .